Height: 12 to 13 inches (30-33 cm) at the withers. Weight: Proportionate to height between 5-8 kg. – The Cavalier should always appear well-balanced. 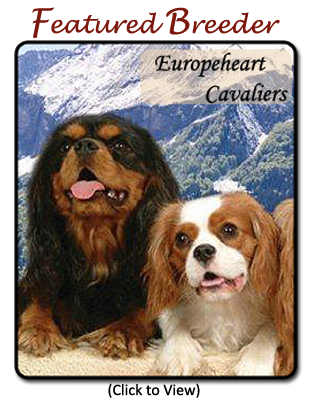 The Cavalier is a charming little dog, elegant yet sporting in nature and adapts well to most living environments. He is wonderful with children as well as an excellent companion to senior citizens. His temperament is both sweet and affectionate. He is intelligent, happy, outgoing, playful, and always willing to please. Because of his playful and sporting nature, he will instinctively give chase to anything he deems to be fair game (squirrels, cats, rabbits, other dogs, etc. ); therefore, it is important that he be kept in a fenced yard and on a leash when walking. Though Spaniels were originally bred as hunting dogs, the Cavalier has been bred exclusively as a companion dog since the days of King Charles II. The Cavalier is seen in the show ring, in obedience competitions, agility, tracking, and he also makes an excellent Therapy dog. The Cavalier has large, round, dark brown eyes and long, silky hair on their ears, tail, belly and legs. The coat comes in either: Red and White, known as Blenheim – Rich chestnut markings well broken up on a pearly white ground; Tri-colour – Jet black markings well broken up on a pearly white ground with rich tan markings over the eyes, on cheeks, inside the ears and on the underside of the tail; Ruby – which is a whole-coloured rich red; or Black and Tan – Jet black with rich, bright tan markings over the eyes, on cheeks, inside ears, on chest, legs and underside of tail. The Cavalier King Charles Spaniel dates back to the early 1600’s and descended from the Toy Spaniels of Europe. He became virtually extinct however, during the Victorian and Edwardian eras as short-nosed breeds took the forefront. By 1923, the breed had been replaced by the English Toy Spaniel (known as the King Charles Spaniel in Britain). In 1926, an effort to revitalize the breed was started by Mr. Roswell Eldridge and the Cavalier King Charles Spaniel Club was founded in 1928. In 1945, the Kennel Club (UK) granted separate breed status for the King Charles and the popularity of the breed spread around the world. The breed gained recognition by the Canadian Kennel Club in 1957 and by the United Kennel Club in 1980. However, due to the small population of dogs in the U.S., the Cavalier did not gain full breed recognition by the American Kennel Club until 1996. Mitral Valve Disease (MVD): The most serious health problem found in the Cavalier King Charles Spaniel breed is Mitral Valve Disease (MVD). This is a problem where the left (or mitral) valve of the heart can thicken and degenerate leading to congestive heart failure and eventually death. MVD is common in most toy breeds, however, in the Cavalier there is an unusually early onset with a more rapid progression of symptoms. In addition, Cavaliers who have developed MVD which progresses to congestive heart failure are susceptible to Chronic Renal Failure. For additional information, see Mitral Valve Disease and Cavalier King Charles Spaniels from CavalierHealth.org. Syringomyelia: Found to be an inherited condition in Cavaliers. The condition occurs when a Cavalier is born without enough room in the skull that contains the back of the brain. Damage is caused when fluid surrounding the brain is forced into the spinal cord. Signs of the disease are most commonly noticed in dogs between the ages of six months and three years but has also been diagnosed in dogs as old as ten years. The most common symptom is scratching on, or in the air, near the shoulder when the dog is excited or walkinig on a lead. Affected dogs may also be sensitive around the head, neck and front legs and often cry, yelp, or scream out in pain for no apparent reason. They may also develop a permanently twisted neck or have a wobbling gait in the hind legs and/or weakness in the front legs. At present, the condition can only be identified by MRI scan and there is no test available to identify carriers. For additional information on Syringomyelia, see Syringomyelia — Information relating to the progress of the research being made into this disease, from The Cavalier King Charles Spaniel Club U.K. Eye Problems: Cavaliers do not generally suffer from any serious eye problems, however, they can develop cataracts and other eye diseases. Episodic Falling in Cavalier King Charles Spaniels: Also referred to as “Falling Cavaliers” or “Collapsing Cavalier Syndrome”, is a syndrome of muscle stiffness and collapse. The underlying cause for the condition is still unknown; however, it has been seen in the breed for over 40 years. Often misdiagnosed as epilepsy, your veterinarian or breeder may not be aware of the disease as it is still not recognized in some parts of the world. Some of the symptoms of Episodic Falling include: seizures with the dog remaining conscious; the dog tumbles or freezes; or the dog falls, tries to rise and then falls again. For further details, please see www.episodicfalling.com — a website dedicated to helping others find answers and support. Eye Examination by a board Ophthalmologist; initial exam at 8-12 weeks, follow up at 12 months, annually until 5 years old, every two years until 9 years old. Cavalier King Charles Spaniel Health Foundation — Organized exclusively for charitable, educational and scientific purposes to promote the health and well being of dogs, specifically Cavalier King Charles Spaniels. It supports education and research related to the history, character, care, breeding, genetics, and health problems of Cavaliers. CavalierHealth.org — Dedicated to providing the Internet user with access to factual information about the major, severe health disorders afflicting the Cavalier King Charles spaniel and that are presumed to be inherited, including mitral valve disease (MVD), syringomyelia (SM), hip dysplasia (HD), luxating patellas (knees), retinal dysplasia, and other debilitating and/or painful disorders to which the Cavalier breed is predisposed. ACKCSC Charitable Trust — Formed for the protection of the health of the Cavalier King Charles Spaniel and to insure the continuing health and welfare of the Breed. Canine Health Information Center (CHIC) — Cavalier King Charles Spaniel Breed Requirements — Providing a source of health information for owners, breeders, and scientists that will assist in breeding healthy dogs. CHIC is a centralized canine health database jointly sponsored by the AKC/Canine Health Foundation (AKC/CHF) and the Orthopedic Foundation for Animals (OFA).